Sir Cadwell of Codswallop is a cheerful and endearingly mad lost soul who resides in Coldharbour. He is the oldest of the Soul Shriven, and was already insane even before he left Tamriel. He is a pivotal character in the Main Quest as well as the Coldharbour invasion quests. Cadwell regards himself as a daring knight, and has spent so much time in Coldharbour that he has become a part of the realm, teleporting around at will and viewing Tamriel as only a pale reflection of his home. He has a pet bantam guar called Honor, though according to him, it is his noble steed. 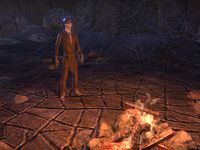 At the conclusion of the Main Quest, Cadwell becomes a servant of Meridia and gives you the Cadwell's Silver and Gold quests. He will return in the upcoming Elsweyr chapter. 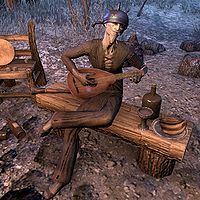 Cadwell will first be encountered in the Wailing Prison, playing the lute and surrounded by Soul Shriven by a campfire. As you approach, he will be regaling the surrounding Soul Shriven with a short ditty. Cadwell: "One fine day in the middle of the night, two dead kings got up to fight. Back to back they faced each other, drew their bows... and stabbed themselves!" "Sir Cadwell, yes indeed. A pleasure! And fair Lyris! Good to see you, m'dear! How are you, then?" Lyris and I are trying to gain entry to the Prophet's cell, and the door is sealed. "Oh dear, oh dear. Well, that is inconvenient, isn't it? Tell you what—I happen to know another way in! Much more of a scenic route. Rather a fun little jaunt, actually. Full of traps, and corpses, and nasty beasties filling up the bits in between." How do we get through all of that? "Rather cautiously, I expect. Watch your step, hold your nose, and do mind the traps. There'll like as not be a fair dose of running and skull-bashing as well." "Follow the river. You'll find the door to the Undercroft at the water's end. Once you're inside, stick to the light and you'll find a ladder that will take you right up to the Prophet, straightaway. Do give him my best!" "Best of luck. Do check in now and again, won't you?" "Tell me about yourself, Sir Cadwell." "Well, there's not much to tell, is there? It's the same old pish-tosh. Gallant knight, epic quests, rescued maidens. I came to this land when my head was quite unceremoniously separated from my body. Bad luck that, but you make the best of things." "Oh, quite a long time. In fact, I wouldn't be a bit surprised if I was the oldest of the Soul Shriven. Of those who didn't go feral, that is. I know every tunnel and path, every nook and cranny. The others look up to me, I suppose." "How do you know Lyris?" "Ah, Lyris. Girl's as mad as Sheogorath's jammies. Heart's in the right place, I suppose. Says she's got to rescue the Prophet to save us all from eternal torment. How an old blind man could do that is quite beyond me!" "What do you know about the Prophet?" "An Imperial gentleman. Apparently he was once a powerful mage, but the years haven't been kind. Lyris says he knows of a path back to Tamriel. I rather think that if one existed, I'd have found it by now." "You don't think there's a way to get home?" "I hadn't actually given it much thought. Anything's possible, I suppose. Truth is, I've been here so long, this place feels like home. But a good uprising now and again is a pleasant diversion, so where's the harm, eh?" "I say, jolly good timing. Lyris, enchanted, as always. And you—you're looking fit for someone so … how can I put it? Deficient in the soul department?" Sir Cadwell? What are you doing here? "Wherever the forces of evil prey upon the innocent, wherever souls are stolen and bodies shriven, wherever a people cry out for justice, there goest I! I mean, this whole eternal servitude business is rather nasty, don't you agree?" We need to find a way into the castle. "Dibella's garters, why? Lovely grounds, no question. But it's positively brimming with angry cultists carrying rather large weapons!" We need to rescue Abnur Tharn. It's complicated. "I see, I see. A rescue, is it? Well, that's a different kettle of fish, isn't it? Hmm. There is a cistern that drains into the waterway. The door is locked, but that's not stopped me before. Why don't you meet me there and we'll see what's what?" "This whole bloody castle sits on top of an ocean of unstable Oblivion-whatsit. The Daedra use pipes to control the flow of it all and it comes out as steam." "Well, most of the doors in here are sealed with pressure from that steam. It's all rather complicated, but in a nutshell—if I can tamper with the pipes, we can open the doors to the inner keep and you can slip inside." "Well, I can handle the tinkering, but you'll have to keep the beasties off me. It will be quite a romp! Cadwell : "Onward! Ha ha!" And if you happen to speak to him through the dungeon, he'll gleefully cheer: "High steps! Come on!" Cadwell : "Don't worry, this will get you inside with a minimum of fuss." Cadwell : "One more after this one." Cadwell : "This should do it!" "A pleasure. Think nothing of it. The merest trifle. Truly. You'll find this Tharn fellow at the top of the Tower of Bones. You'll need to make your way through the keep's heart to get to it, but it's not terribly far." "I understand the King of Worms has set him to the task of inspecting the soul gems that find their way into the castle—which is to say, well … all of them. You'll see crates of the things scattered around the premises." You should come along. It might be good for you. "Indeed? Well, I might just take you up on that. But safety first! I'll stay here for the nonce and make sure nothing comes to bugger up our little adventure from behind." Speaking to him after the conversation: "Well, don't dally about here, you've got a princess to rescue. It was a princess, wasn't it?" Cadwell : "Hello again! Need a way out?" Cadwell : "I'll have that open in just a moment." "Arkay preserve us, you're as battered and bruised as a peach in a sack of rocks! Bit of the old derring-do, was it? No matter. You'll be needing an escape route, no doubt?" "It's what I do, quite honestly. We should probably hurry it up. The entire castle is as bristly as a sack of sewing needles after all that noise." "Come with you? You mean leave Coldharbour? Well, I don't know. It's been a very long time since I've seen the world I left behind. Do you think it's wise?" "Well, that wouldn't do at all. And it's not so bad here, actually. Oblivion has its charms, doesn't it? Go on, you scamps. There's a grate just ahead that leads down to the rubbish tip. Do mind that first step, though!" "Well, go on then. No worries, I'll be fine. They haven't made a cage that can hold this knight. Not yet, at any rate." "Well, that's settled, then. And after all, you do need someone to lead you out of here. Cadwell : "Into the chute! Come on!" "I say, you do get into some wild adventures, don't you? This place is so odd. Did you know that the fire here is actually warm? Brilliant!" "This cave is quite lovely, but have you seen the nightmarish landscape outside? How do you people keep your sanity? I believe I'll just remain indoors. Do let me know if I'm needed for anything heroic, won't you?" "I understand you visited the Halls of Torment? Marvelous place. Marvelous. I'm not a fan of the tortured screaming, but otherwise it's quite lovely." "Sancre Tor? Never been there, but I understand it's where the Reman dynasty is entombed. Why do people even bother burying remains anymore? Seems rather a waste of time these days, what with everyone popping up from their graves. Cremation, I say!" "You're a fan of poetry, aren't you? How's this, then? I picked it up and put it on! I rather like that one." "They're having an important meeting and asked if I'd give them some privacy. I mean, do you believe it? Where's the trust? Pop on out to the rubbish tip, Cadwell, there's a good lad. Do I mind? Oh, I have no mind. I'm the village bloody idiot!" "So, going toe-to-toe with the big bad then, are you? Smashing! Good luck to you! This whole Planemeld thing seems like nasty business. I prefer my Coldharbour with a bit less Tamriel in it, thank you very much!" Once you step into the portal created by Vanus Galerion, you will find yourself in front of a large, locked door in Coldharbour. It will become clear that no one else from the invasion force is with you. Soon you will see Cadwell running towards you. When you speak to him he will clap due to your apparent survival. "Survived then, have you? Jolly good, jolly good." "Rotten luck. They arrived in Coldharbour, but in entirely different locations. Bloody unpredictable, portals to Oblivion. Not to mention Molag Bal's defenses. Nasty beasties abound. Off you go. Over the bridge and head inland. There's a good chap!" After the bad news, he continues speaking. "Welcome back to Coldharbour, old chum. Jolly good to see you! I was afraid you'd snuffed it." "What bridge? Is there a bridge? Tricky things, bridges. Tend to have all kinds of hideous creatures living beneath them. Except that one over there. That one leads to the Hollow City." Right. I'll head to this Hollow City. "Dreadfully dull place. And a real eye sore, if you ask me, but I suppose it's where you'll want to start your quest. Quest. What a simply fabulous word. Quest. Quest. Quest. I just love how it rolls off the tongue." After learning about the existence of the city, you can as Cadwell about your current location and Cadwell himself. "Welcome to the beautiful gardens of Coldharbour! Do have a look around. Lovely day for it. Soak up the ambiance, the grandeur, the wonder of it all!" Tell me about yourself, Cadwell. "I have the oddest feeling we've discussed this before. Or did I already mention that? No matter. I am Sir Cadwell the Undaunted, Knight of the Court of Coldharbour, Champion of Chivalry, Defender of the Defenseless, Shepherd to the Soul-Shriven." "Am I not speaking the common tongue of Nirn? I was once fluent, but time does get on, doesn't it? I'm sorry, I forgot the question. Though I'm quite sure I already answered it. You really should pay more attention." "Did I? I don't recall that. There is a bridge just ahead. Leads to the city. Rather a drab, empty place at present, but a little paint, a potted plant or two …. And honestly, it's not like you've got a lot of choices right now. So, off you go!" "Sane? That's in the north, isn't it? I don't believe I've had the pleasure." "Stand back, vile beast, lest I slay you in no uncertain terms! Oh, it's you. Taking a stroll, then? Enjoying the beautiful countryside?" "And you're doing a smashing job of it! Jolly good! Wait a moment. Did you go through that portal? Did you meet the Observer?" "Jolly good! I've always wanted to play the Observer's game. But now that you've done it, I suppose there's no point, is there? I'm sure I'll find some other quest to occupy my time. So, where were we? Why did I come here, again?" "Brilliant! Just great! Truly! I wish I'd thought of it. Off with you, then. I'll make sure everyone arrives safe and relatively sound in the Hollow City." After you have spoken with Telenger the Artificer at the camp and completed the The Library of Dusk quest, Cadwell will appear out of a portal. Cadwell: "Ah, the good ol' library! Read many of the books here myself. I love the ones with all the pictures in them." You can then speak with him to see what he is here for. "Ah, there you are! The Groundskeeper said you had a pickup. I assume she was talking about this merry band? Good to see them alive and well. They are alive… right? Not that I mind the odd zombie. It's the smell I can't abide. Nasty, that." "Yes, whenever I visit a library and do some reading, I usually fall right to sleep. Can't keep my eyes open. Great for when I get insomnia. But enough about my sleeping habits! I shall do my heroic duty and bring them back to the city unharmed." "No worries there. Almost all the people I've traveled with over the years have remained in one piece for the duration. I've seen the odd dismemberment, but that's far more the exception than the rule." Once you have freed the tavern's patrons, Cadwell can be found outside on the porch. "Found the old Everfull Flagon, eh? Interesting place, the Flagon. Glad someone's finally got it sorted out. Good show!" The Everfull Flagon patrons need to get to the Hollow City. "Smashing idea. Really excellent. They'll be safe there. How about that thane? Excellent mead, certainly, but I always thought he was a bit dodgy." Why didn't you try to help the patrons? "One must choose one's battles, mustn't one? Rescuing maidens, fighting injustice—those are my specialities [sic]. But taking mead away from drunken Nords? I mean, really. That way lies madness." Can you help these people get to the Hollow City? "Righto! Always happy to pitch in. Lend a hand. Steer a course. Make a difference. I'll get them to the Hollow City. Very nice inn there. Plenty of mead. They'll feel right at home." 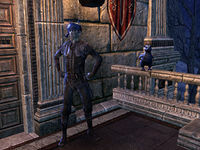 Cadwell and Honor outside the Fighters Guild. After you have rescued King Laloriaran Dynar, you can find Cadwell outside the Fighter Guildhall, along with his trusty companion—Honor. "Smashing. So glad you could join us. Welcome to the Fighters Guild, which is a rather mundane name, isn't it? Though it is precise. They fight things and they're in a guild. Works rather well, actually, come to think of it." You found the Fighters Guild members? "Actually it was Honor who found them. Have you met? We've been together, forever. He knows Coldharbour almost as well as I do." "Pish-tosh! Honor isn't a pet! He's my faithful steed! He does mistake the odd Wood Elf for a tasty treat, but they've been known to do that themselves, haven't they?" "I heard there was an important meeting going on. I'm sure they meant to invite me. After all, important meetings lead to quests, and quests are my specialty! I'm always ready to smite evil and preserve the natural beauty of Coldharbour." When you reach the door leading to the Mooring and the Great Shackle, Cadwell will be waiting with the others. "We meet again, fellow knight! Wonderful day to sally forth, wouldn't you say?" "Oh, you know. A hidden path, the odd secret door, and Bob's your uncle, here I am. I heard you were going to attack the Great Shackle. That's a quest worthy of a knight of my stature!" When you and the group first enter The Mooring so Vanus Galerion can destroy the Shackle. Cadwell: "Have at thee, vile Shackle! We're going to give you a damned good thrashing!" Once the Great Shackle is destroyed, Cadwell will cut into Vanus' self-congratulations with some news. "I don't understand what you people see in this city. I mean, compared to the rest of Coldharbour, it's a bloody rathole." Why didn't you mention this planar vortex before? "I'm not entirely sure. I suppose it slipped my mind. Besides, I thought everyone knew about the planar vortex. Can't take five steps in Coldharbour without hearing someone screaming about it. Of course, those screams are rather unintelligible …." Pretend I never heard about it. "Oh, it's the planar vortex. The penultimate convergence of the Planemeld between the worlds. I haven't been there myself, mind you, but Honor tells me it's a nasty place. All those horrible Nirn bits melting into the beautiful Coldharbour scenery." Can we stop that from happening? "It's already happening, my good chap. And the only access to the planar vortex is through the portal in Molag Bal's courtyard. Wait a moment! Are you thinking of assaulting the Lord of Schemes' labyrinth and going through the portal? Count me in!" When the War Council is called, Cadwell can be found eating some bread and watching the show in the Chapel of Light. If you talk to him, he will say. "I heard there was an important meeting going on. I'm sure they meant to invite me. After all, important meetings lead to quests, and quests are my speciality [sic]! Cadwell will then leave with the others. After speaking with King Dynar, Cadwell will be waiting at the gates to the Chasm, he will have some bad news about the army's progress. "Well, this has my knickers in a twist! We have a perfectly fine army, but what good is it? Sitting around this side of the Chasm, twiddling its collective thumbs. It's rather embarrassing, if truth be told." "The situation? We're well and truly flummoxed! Before we could cross the Chasm, before we could confront Molag Grunda, we were stopped by a few irksome focus stones! The wee ginger mage says we need to break the stones, but good luck with that!" Break the stones? Sounds easy. What's the problem? "Nothing other than the multitude of Dremora sitting on top of them! I could handle this myself, but I didn't want to make the rest of the troops sad by showing off my awesome battle skills. But, you, on the other hand. They're used to that from you." You can follow the Cadwell through the gates to the Chasm and find him standing next to Gathwen. "The wee ginger mage can tell you more about the focus stones. Mmm, ginger. You must try my clannfear haunch in pickled ginger. Exquisite! Not to brag, but I'm almost as good a cook as I am a warrior." After you have destroyed the focus stones, you can find Cadwell with Gathwen at the portal to the second tier. "Good show! The portal belongs to us now! Sir Darien and that lovely lizard have gone on ahead. I think he might be a bit intimidated by our prowess on the field of battle, and he's trying to compensate." Any idea what I should expect, up there? "Grunda's a cheeky one, and she knows we're getting close. She's summoning reinforcements faster than Darien can kill them. You'd best get to it!" I need to ask you something else. "By all means. Do you want to know how many Daedra can dance on the head of a pin? How I manage to stay so cheerful even in the most perilous of circumstances? What's my favorite color? Ask away!" What can you tell me about Molag Grunda? "Molag Grunda? Large woman with wings? Bit of a temper? Guards the gatehouse? I hear that she's the daughter of Molag Bal, if you can believe that! He never struck me as a family man, but who am I to judge?" Why do you know so much about Coldharbour? "It's my home, old chum! Has been for years. I know every wondrous nook and cranny. Beautiful place, full of fascinating creatures. Of course, they often try to kill you, but that's the challenge of it, isn't it?" I'm on my way./I'm ready. Let's move out. Once on the second tier, Cadwell will at first stay with Denthis and Dithis to guard the portal. "I'll guard the portal and make sure we maintain control of this location. I may have to take on a Daedroth or two single-handedly, but that's to be expected in my line of work. See if you can't cut off the source of those reinforcements, would you?" After closing the portals with Walks-in-Ash and Darien Gautier on the lower levels, Cadwell will be waiting for you at the threshold of Molag Grunda's lair. "I think our friends have the Chasm well in hand. What say we pop in for a chat with Molag Grunda?" "Right! We control the rest of the Chasm now and the troops have matters well in hand. Let's go and have a sit down with Molag Grunda. She's always good for a laugh and a song." What can we expect in there? "From Grunda? Rudeness, hostility, sarcasm, and most certainly a large amount of open hostility. I've no idea how she keeps house, but I imagine we'll find the usual Daedric touches that make Coldharbour feel so warm and inviting." "I can't wait to see Molag Grunda's face when she sees us. She and I go way back, you know. Once we get inside, we cross one little bridge to reach the gatehouse. Follow me!" Cadwell: "There's a trick to getting into the gatehouse proper, but for the life of me I can't remember what it is. Not to worry, though. I'm sure it will come back to me." If you speak with him he will mention his love for the particular landscape. "I've always loved this part of the Chasm. So majestic. Takes your breath away, doesn't it? On occasion, quite permanently." Once you cross the span, he will remember the trick to opening the door. Cadwell: "Ah, of course! I remember now! There's a flywheel in each of the side antechambers. We need to start them spinning to open the main door." As you enter the northern flywheel chamber, he will remember more. Cadwell: "It's all coming back to me! There's a lever across the chamber. Just give it a good tug and that flywheel will be spinning in no time." If you speak with him after unlocking both flywheels, he will mention he's looking forward to the visit. "Shall we go and have a proper visit? I'm sure Grunda's prepared something lovely, just for the occasion." Cadwell: "What an impressive door! Look at that craftsmanship. Remarkable! Grunda always had good taste, I have to say." Cadwell: "See? I knew that would work! A word of advice. Guard your pluckables. Grunda enjoys plucking out eyes, spleens... anything pluckable, really." Once Tiny and Molag Grunda have be defeated, Vanus will enter through the door. After leaving Grunda's Gatehouse, Cadwell will be taking a break at the Orchard Wayshrine just outside the door. You can have a chat with him, though he will be disappointed in Grunda's lack of manners. "Maybe next time Grunda will serve a proper tea when guests arrive. I mean, really! The social graces are simply beyond some people." I don't think she was expecting guests. "What's that? Sorry, bit of a problem with the right ear ever since I had that run-in with a titan. Rings like the bells of Cyrodiil when the weather turns." You seemed to know Molag Grunda. Does it bother you that we had to kill her? "Oh, she'll be back eventually. You can't really destroy a Daedra, no matter how hard you try. Once you complete Crossing the Chasm, he will instead say. "What a rousing adventure! I wonder what else awaits intrepid knights such as we? I think I'll commission a ballad to describe our exploits. How do you feel about iambic pentameter?" When you agree to help Vanus with the vampires in the Orchard. "Planning to take a stroll in the Orchard? The denizens of that place are quite interesting. And by interesting, I mean they'll like as not try to tear your face off. We've a lot of that here in Coldharbour, for some reason." He can be found strumming his lute on the land bridge outside the Reaver Citadel. He will comment on Vanus' disimissal of Lyranth. "Imagine, a fortress full of Dremora! We'll have a jolly good time storming these walls! I wonder if we shouldn't have dismissed the Dremora lass so quickly, though. When they go out of their way to talk, I find it's usually a good idea to listen." Once you break the wards to the Fighters Guild Hall, Cadwell will be inside in the stairwell. "My old chum. My bosom companion. My comrade in arms. How long has it been? I've missed you, terribly! By the way, what took you so long? The King is upstairs. He wants to speak to you." Why aren't you outside fighting? "I'm preparing myself to dazzle the enemy! I'll cut them to ribbons, I promise you. Just need a moment to buff the old breastplate. The enemy expects a certain amount of resplendance [sic] from a hero, and I shall not disappoint!" What are the orders from the king? "Oh, Dremora … something, something. You can ask him yourself, he's right upstairs. For a king, he mumbles a lot. Lovely crown he's got, though. Rather dashing, isn't it? I wonder where I can get one of those." After you have gotten your next set of orders from King Dynar, Cadwell will casually mention his latest feats performed while you were gone. "I stepped out for a moment, dispatched a dozen Dremora, then popped back in. Just wanted to make sure I had the opportunity to see you off. Well, off with you, then! So long! Toodle-oo! Don't forget to write! Ta-ta! Cheerio!" Cadwell can be met once again outside the Reaver Citadel Pyramid with Gathwen and Lyranth. "Exciting, eh? Beasties with wings, an angry Valkynaz—you even managed to befriend a Dremora. Clever, that. I made friends with a Dremora once. We had some grand adventures, right until she tried to cut out my lungs. Oh, those were good times!" Is this all fun and games to you? "Well, not just fun and games. There's excitement and bloodshed, too. Your Dremora lady friend says she can open the door to the pyramid, but she requires Daedric blood or some such. I'm afraid I'm fresh out of it." Once Lyranth unlocks the door, Cadwell will be spoiling for a fight. "Not to worry, I'll be right behind you! We'll give that Valkynaz the thrashing he so richly deserves!" After you have killed the Valkynaz and obtained the Labyrinth Key, Cadwell will be doing jumping jacks near the portal entrance. "Every muscle must be properly stretched before we rush into battle. Wouldn't want to get a cramp when we make our heroic charge into death's chomping maw, would we?" Once you have spoken with Hahnin and Gabrielle Benele, Cadwell will be one of the fighters you can take with you during the initial assault. "About time you got over here, old chum. Exercise is all well and good, but if I keep this up much longer I'll be useless in the actual battle!" I may need your assistance once the assault begins. "A quest? How marvelous! I shall march by your side into the darkest depths of foul iniquity, our weapons aloft and aglow with the fires of eternal righteousness! You honor me this day, my friend. I gladly accept this mission." Accompany me on the initial assault. Let me speak to the others before I make a decision. "I love what the Dark Prince has done with this place. Quite lovely. Shame we have to march an army through here. Soldiers rarely take care to watch where they step." needs dialogue for when he is a companion. You will meet Cadwell again when he brings Vanus to you once you escape the Statue Room with Gabrielle Benele. With the lull in action, you can talk to Cadwell. "It took a bit of work, but I was able to track you down. Just one of my many gifts, if you must know." Once you arrive at the Planar Vortex, Cadwell will be one of your allies who will emerge from the portal. You can talk to him before starting the final leg of your mission though you will need to remind him why you are here. "I always wanted to see a planar vortex up close and personal. Isn't that sky spectacular? Wait, what are we doing here again?" We're here to stop the Planemeld …. "Of course! Our epic quest. It must have slipped my mind. I've been on so many of these adventures, you know. After a while they tend to blend together. Kind of like these two realms are doing. Oh, sorry old chap! That's a bad thing, right?" Yes, the Planemeld is a bad thing. "Yes, yes, I knew that. Terrible getting your dismal world into the wondrous vistas of Coldharbour. Like dipping bread in honey. Frightfully repulsive! Still, I believe this might just be my best quest yet!" [Intimidate] When this is over, I'm going to make you try bread and honey. "Well, that'd just be disgusting, wouldn't it? Do you know where honey comes from? It's regurgitated flower nectar! Oh, very well. I accept your challenge. Now let's go and finish this so that I can taste your bitter poison." Aren't you concerned at all? We're heroes, my boon companion, and heroes always win! Let that be a lesson to you. Now let's go and stop the Planemeld!" During the push to the central point, Cadwell will disappear at some point. After being called to the Harborage for the final time, Cadwell will be there. "Oh! Hello there. Surprised to see me? So am I, so am I. I do get around, don't I? Haven't the foggiest idea how I do that, honestly." He will make his reappearance during the epilogue, which will differ depending on who was sacrificed for the Amulet of Kings. Cadwell: "I don't know that this world will ever see the like of Sai Sahan again. He was the embodiment of loyalty and discipline—qualities that he tried to share, not by word, but by deed. You can make use of that. He's part of you now, you know." Cadwell: "Our noble Redguard friend may have shuffled off this mortal coil, but his spirit will live on, through you. Sai Sahan: "How have we returned? The last hing I remember was being overwhelmed!" Cadwell: "Ah, fair Lyris. She will be missed. Her light may have left this world, but her spirit lives on in you … perhaps even in a literal sense. Take comfort in that." Cadwell: "And she did give her life to save this world, didn't she? Though I can't understand why you're all so fond of it. Dreadful place. Ah well, it's horses for courses, I suppose. No matter who is sacrificed, Cadwell will call you over once you have spoken to the survivors and parted ways. Cadwell: "Don't toddle off just yet. Might I have a word?" He will then go over to the Light of Meridia. "I take it you ran into Lady Meridia? Lovely woman. Charming. We get on famously! While you lot were having yourselves an epic row, I gave her a shout. Asked if she'd be willing to help us out if things went badly." You asked Meridia to pull me out of Coldharbour? "The trick of it was the timing. With every blow to that Daedric windbag, you freed hundreds of souls. She was able to catch yours before it wandered off. Jolly good trick, that." "This is delightful! World saved, heroes gone their separate ways, and this knight has a new mistress to serve. Bravo! Couldn't be happier! Smashing! Truly!" Once he delivers his eulogy, he will have something more for you. This becomes available once God of Schemes is completed. If you don't start Cadwell's Silver immediately, when you approach a city, his projection will appear and automatically give you the quest. Cadwell: "Ah! There you are. When you have a moment, find me at the Harborage. I've got a question for you." Cadwell: "Ugh. Tamriel. How do you stand it?" When you speak with him at the Harborage, Cadwell will admit that he didn't think you and your companions would succeed. "I'm positively chuffed things have gone so well! To be completely honest, I didn't think we had a ghost of a chance. But then, if we weren't up against overwhelming odds, we wouldn't be heroes, would we?" What should I do now, Cadwell? "Still itching for more adventure? Smashing! Have you ever wondered what would've happened if you'd woken up somewhere else? Washed up on a different beach? My new mistress provided me with the means to help you, if you're up for the challenge!" Help me? What are you talking about? "Touch Meridia's light and see the world through the eyes of your former enemies. But fair warning—you will no longer be seen as a great champion. Even familiar faces will see you as a soulless drifter, lost in an unfamiliar land. What say you?" You will then be prompted to touch the crystal. He is voiced by John Cleese. Prior to One Tamriel the only way to visit the other alliance areas was through Cadwell's Almanac, which is only viewable after the Main Quest is completed in your starter alliance. He has written several books, including Famous Coldharbourites, parts 14, 21, and 37, as well as the Soul Shriven crafting motif style. This page was last modified on 28 March 2019, at 23:41.